I put out a request for availability today to wrap up a fundraising campaign that took the better part of the last year. I’ve also spent several days assembling a hard copy of all the documentation for the next team – as well as creating a digital backup. It’s a good and necessary way to see where we have been and start to evaluate the results. Past lives have meant working my way through several such campaigns. Because I know and understand the process, that has worked well for me but also created problems. Many responded quickly and and contributed well. Several new people came aboard. By working in pairs with team members, I limited the involvement of the whole group. Doing the work is the best motivator and builds commitment of the fundraising team. The kick off event was too tame. It needs to be exciting. The closing event was better but also too cautious. These things need to be fun. While not holding too many meetings at the beginning was an advantage, we should have met regularly during the campaign itself to keep the energy level higher. Keeping a firm check on follow up might have produced better results. There was much “preaching to the choir”. It’s more demanding to make the case for what the money does in terms of changed lives. We need more and better stories. These are just my own observations. I look forward to hearing from the others. I work from home — that is, I do stuff that is work even though it is voluntary and done for love rather than money. I was awakened that morning by the sound of something falling nearby with loud plops. A look out the apartment window revealed a large yellow tube leading from the fifth floor of the building next door to a large red dumpster. 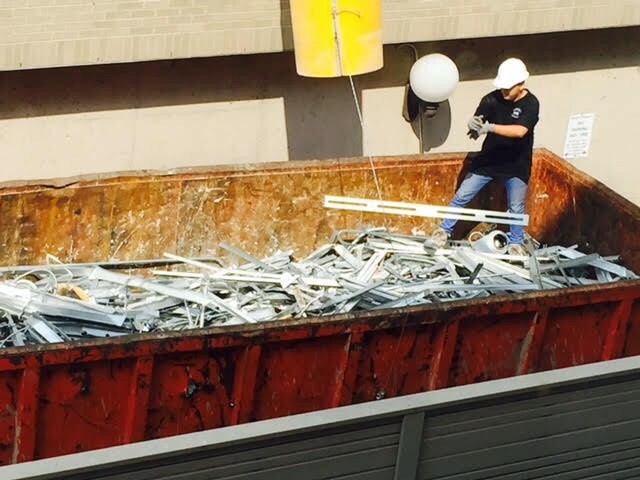 What was falling through it was a mix of drywall and now unnecessary debris from the company’s former executive suite. Its head office had recently vacated, the building had been sold; and rumour has it that it is to be converted to a condo. The noise wasn’t so oppressive — but watching the lone worker on the ground moving waste matter around was a contrast to my ieisurely start and enjoyment of my morning coffee. We seldom get so up close and personal to the variety of work that is part of the modern world. Sitting in front of screens and reading about CEO annual increases of millions doesn’t quite jibe with this man’s day — living among modern waste in more ways than one. The plops continue. We are now on the fourth large container and the contents have changed from plaster and insulation to metal strips. For six days four or five men have laboured and it will be interesting to see whether the entire fifth floor has been completed. Clouds of dust from falling plaster have given way to cleaner debris — for which I am thankful. At least I can leave windows on my side of the building open rather than watch the dresser beside the window become covered with white dust. No one else in the apartment building seems much interested in this deconstruction phenomena — but I received word this morning that my next door neighbour next door is reading my blog posts about this. It used to be that people actually talked about local happenings in person rather than reading about them online. C’est la vie. But what about the participants in this deconstruction? Do they have time to ponder the meaning of life in the process? 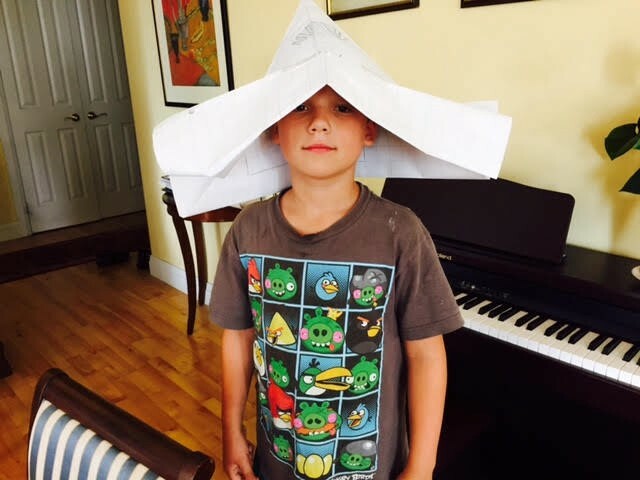 I shared the news of deconstruction with two grandsons who were visiting for the weekend. “Don’t be surprised if you are awakened with a big bang in the morning”, I commented. But they hardly skipped a beat as they constructed new buildings of their own while playing Minecraft online on the Ipad and PC for several hours — just surfacing once to ask for a new Skin Editor. As an old style grandmother who thought kids should go outside, I called for a break. We tried a walk in the park and a Frisbee toss, but the heat soon drove us to the ice cream store and a very hot walk home. Taking a cue from Austin Kleon’s Steal Like an Artist, I encouraged the kids to go Analog for a while, giving each a large sheet of paper and encouraging them to use the whole page by fill it with anything they liked, using a variety of my art supplies. The older one started on a really good drawing of a dinosaur. The younger tried his own version, seemed dissatisfied with it and retreated to return shortly to show me his own version of how to complete the use of the entire page. It’s now been more than a month of daily deconstruction. My life has changed. I go to bed much earlier to avoid being awakened by a daily dumpster crash outside my window at 6:45 am. Four full dumpsters leave most days. During these comings and goings I have filed reports for one of my volunteer organizations, prepared agendas and chaired meetings, planned a fall campaign, worked on a wonderful community day where we hoped to draw 100 and got 200, designed a quick website for a project that is just about to happen, — in other words, dumped a whole bunch of activities into my own calendar dumpster. But I have also realized that all this busyness has replaced some of the other things that I actually intended to do this summer — like writing. And I haven’t added the time spent in feckless pursuits like online crosswords, or surfing Facebook to find the odd interesting thing that wasn’t cat related. Dumpsters, when it comes right down to it, are just containers. They are kind of like my Gmail inbox which I have trained myself to keep quite lean and to clear out as often as possible. The easiest thing to do is to transfer everything read to specific folders and one of my volunteer ones has over a thousand threads of items that are basically dumped. In counting I note that I have 23 active folders full of suchconversations. Most of these can head for deconstruction. But returning to thinking about deconstruction/construction — the best things of the month have reallycome from going analog — hanging out with family, friends, and colleagues, reading books rather than reading stuff online, trying new recipes, sitting and just thinking — and even watching dumpsters. The huge orange box next door will disappear eventually — and probably be replaced by daily deliveries of stuff for reconstruction — just like my Gmail Inbox. The big challenge will be sorting what comes in and becoming less distracted by stuff that deserves throwing out from the get-go. Robert Genn – artist and writer whose twice weekly articles died yesterday. I shall miss him for his humor, wisdom and practical tips – not just about art but about creating. Rest in peace, Robert. Your legacy is in your writing and example.